ThemeParkMama: "Target Big G Retro February"
My kids and I love to garage sale, goodwill or thrift shop and there is nothing more exciting then when you find something that reminds you of when you were a kid, General Mills has helped to bring back those great memories with their Retro Line of Classic Cereals. Each box of General Mills is back in its old school package with a twist of new in the back the Honey Nut Cheerios shows how over time Buzz became a 3D character. Cheerios a well known family brand I don't know if I know anyone who has never tried. Cheerios is the King of toddler food, almost all moms feed their kids cheerios. 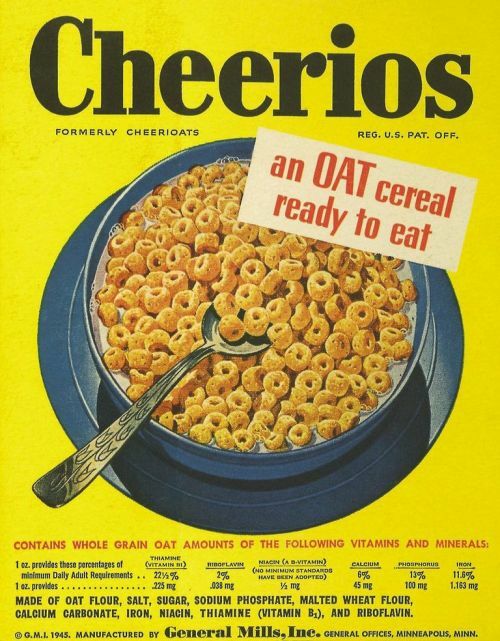 Cheerios has been around for 1945 wow that's some time for it to be a well known name. Cheerios continues to grow strong with new flavors yearly it seems. Lucky Charms now this cereal I have many memories most of them trying to sneak out the marshmallows and hide the cereal, my dad catching me and making me eat more of the cereal, while he had my marshmallows. I still like to purchase Lucky Charms and eat just the marshmallows, I pawn the cereal to my kids. : ) My guilty pleasure lol. 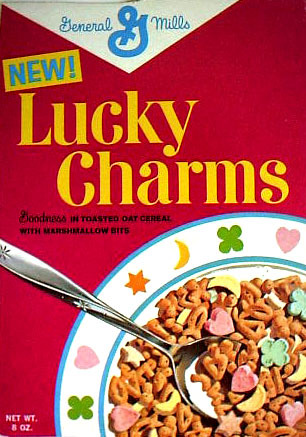 Lucky Charms has been around since 1964. I wasn't even thought of yet when this cereal came out : ) but it became our house hold favorite. Honey Nut Cheerios has been around since 1979 still as sweet as ever. I treat my kids to Honey Nut Cheerios often its still the great taste of Cheerios but sweet which what kid doesn't love sweet. Cinnamon Toast Crunch, which in my time had a baker on it cheerful guy but now its those "crazy squares" which are cute commercials with them eating each other cause they are so good. I love every bit of Cinnamon Toast Crunch, dry or with milk. I love at the end of the bowl you have a sweet milk left to drink, yum. 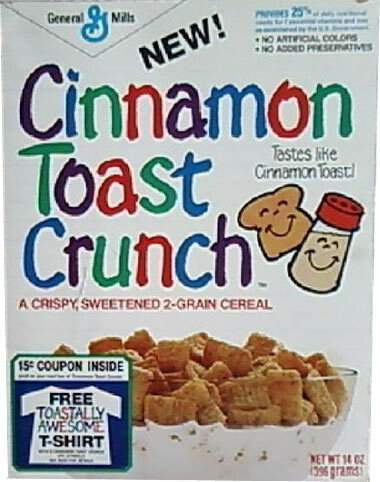 Cinnamon Toast Crunch has been around since 1984. I was only a year old guess my mom must had feed me it often because this is one of my favorite cereals. 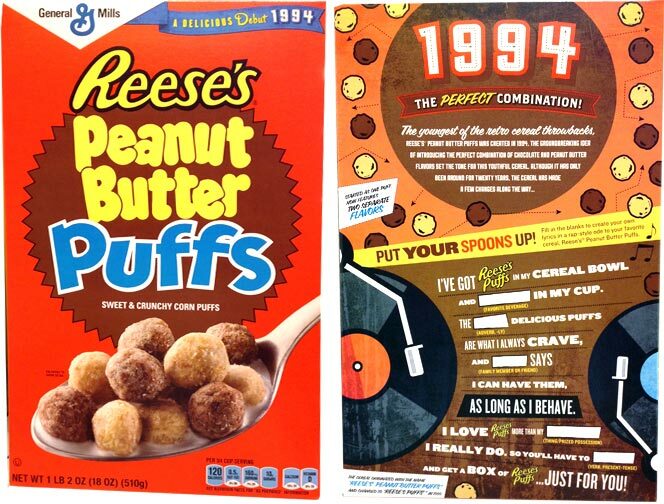 Finally 1994 Reese's Peanut Butter Puffs was introduced, I remember this real well, I was 11 and it was one of the first cereals we bought when we moved into our new home, it was my treat basically for moving without to much complaint. The commercials where parents and kids saying REESE'S?!?!! FOR BREAKFAST???!?!? like wow candy for breakfast..but general mills gave it a great taste and still made it beneficial to eat in the morning. Reese's Puffs still is great and makes a great snack for kids at school or when on the go. Some fun facts about Reese's Puffs click here. All these cereals you can find at your local Target, along with many other retail stores. Look for the new "old" Retro boxes of these and more of your favorite throw back cereals from General Mills.